Fits masts up to 1-7/8" tubing. 18 gauge foot with an 18 gauge tube. Often called peak mount. Zinc plated. This foot is smaller than our 19 series. Note: We are so Happy to have This Universal Peak Ridge and Flat Roof Mount for Telescopic Push Up Antenna Masts for masts up to 2-5/8" Diameter (which is every Brand and Model we can think of) Of all the Models we've evaluated to date, this one is the Best. It starts with a 16 gauge shaped, rolled, seamed Tube stock that has a recessed channel for the inside set of retaining set screw nuts. All of the Hardware is Galvanized and is of a Heavy Duty Nature. The Hinges are also 16 gauge and Hardy Stuff. Matter of Fact, this Mount will be Harder than most Masts, you will probably want to procure a 6 inch section of Black Iron Pipe to place on the inside of the bottom section of the antenna Mast to keep it from Collapsing, as the Double Nut Set Screws do not give. 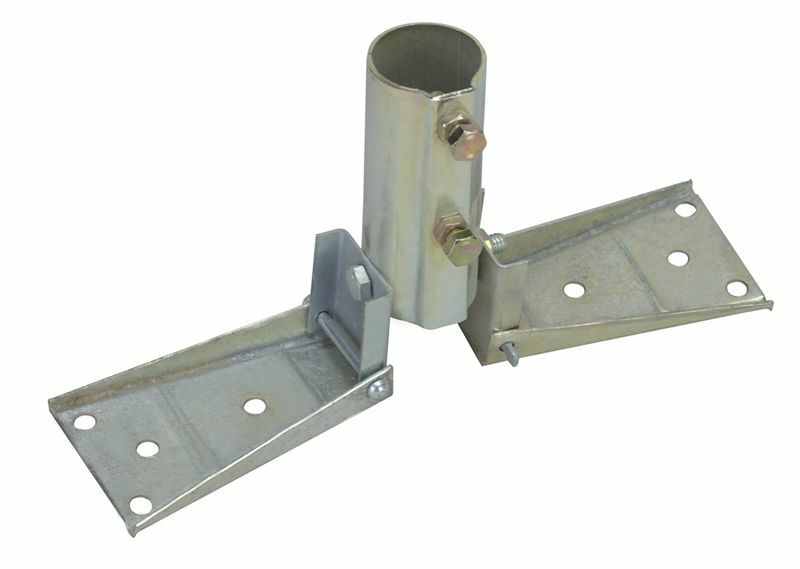 The Bottom Main Assembly Bolt also doubles as the 3rd Hinge which facilitates swinging the Mast up or down from Vertical for Erection and Maintenance. As with all Masts, Guy wire support and Grounding are Critical to Antenna Survival.